Originally posted on Park Life. “Back at my university in Nigeria, my course mates joke that I should be given an award for the most inconsistent class attendance. Despite my irregular presence at lectures, I was actually nominated by my university’s English and literary studies student association for an award of outstanding performance. So much for the student with the low attendance! So no, I’m not a terrible student whose bunking classes, in fact I’m travelling around the world extending my learning at other universities. These have included studying at The California State University in Chico, The University of Missouri Kansas City in the USA, and now my travels have taken me to the University of Gloucestershire in the UK. If you cannot find me at my local university in Nigeria, you will probably find me at another university somewhere on another continent. I just can’t help myself, I am always wanting to travel and experience different educational systems and cultures. In February 2018, I won the British Council Nigeria’s Study UK Exhibition Video Challenge. This got me a round trip ticket to the University of Gloucestershire to briefly study media and journalism. Amazing, right? Today is my second day in the UK and so far I’ve been blown away. The students at the university are so friendly and there is quite some history to explore in Gloucester. One of my first activities here was a tour around the university’s media school at the Park Campus. I was really impressed seeing all the media equipment and watching the journalism students having practical sessions with industry experts as their lecturers. After attending a lifestyle journalism lecture, I spent the rest of my day visiting all three campuses at Park, Oxstalls and Francis Close Hall. It was exciting getting to explore all three campuses, going into the libraries at Francis Close Hall (or FCH for short). I learnt more about the sport equipment, the Performing Arts and Events Centre at Oxstalls and so much more. One of the places I also visited on my first day was the Gloucester Cathedral. Did you know that some of the Harry Potter movies was shot at the Gloucester Cathedral? The Cathedral grounds have also been used for religious purposes for about 1,300 years. So much history in one place! While I stood next to the Cathedral, I tried to imagine myself as Hermione Granger waving my magic wand chanting Alarte Ascendare! As the day went by with lots of laughter and site seeing, it got a little colder in the evening. Someone like myself who is from a very warm climate in West Africa, I really felt the cold. I spent the rest of my evening at the World Cafe in FCH Campus interacting with other international students. 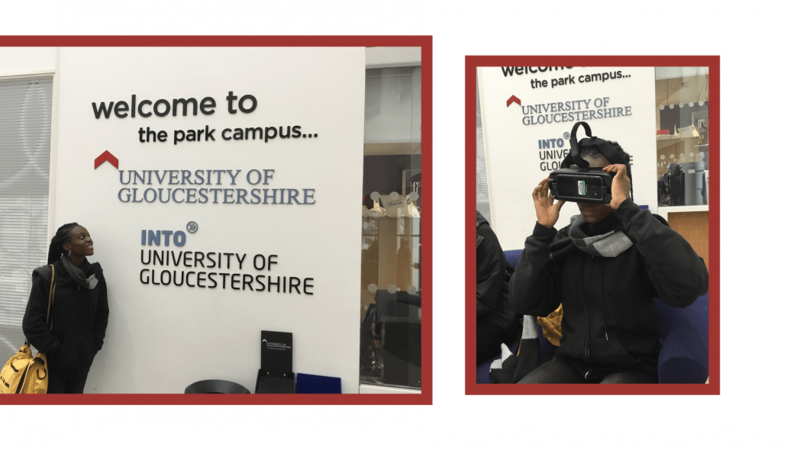 During my conversation with one of the students from Spain, she mentioned to me that she loved the University of Gloucestershire and to her the communal feeling was amazing. By the time I left the cafe I was definitely feeling the same way as I shared goodbye hugs with my five new friends”. Previous articleWhat Exactly is Wrong With Mentees? Next article About Nigerian federal schools and maybe opportunity really knocks on my door once?